This administration and fellow elected officials at City Hall are working to broaden opportunity, and to make this city more affordable and accessible for all. Over the past several years, we have approved over 2,000 units with an additional 1,600 units currently under construction or recently built, and less than two years ago, the City Council made the city’s largest investment ever in anti-displacement measures, including eviction defense and emergency rental assistance, to help keep people in their homes. In June 2017, the city launched the Homeless Outreach and Treatment Team to target the two-pronged problem of mental health and homelessness. This program, staffed by trained outreach workers, will contact homeless people with serious mental health issues and help them access crucial services with the hope of transitioning to permanent housing. Clients will be selected based on a number of factors such as living with mental illness, suffering from addiction, frequent use of emergency rooms and problematic street behavior. The team will work together with The HUB, the city’s coordinated point of entry for housing and homeless services. Moving forward, our aim is to double the number of people who will receive permanent affordable housing and prevent more people from becoming homeless by increasing funding for anti-displacement and eviction defense. This will be done through State of California HEAP and Measure P funds. 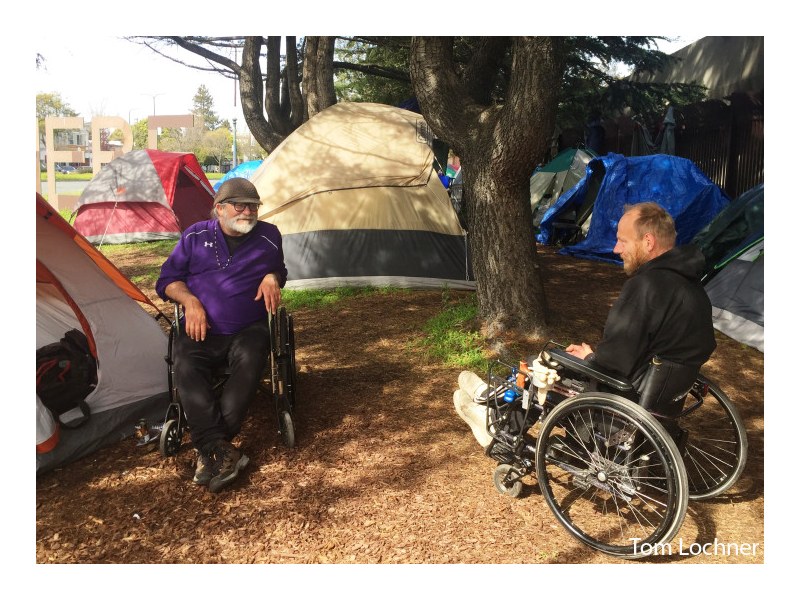 We are also looking to expand “on the street” medical care to those living in encampments through a contract with Lifelong Medical, a nonprofit medical provider. Another critical step taken by the city has been the opening the STAIR Navigation Center, modeled on best practices around the country and first such center in the East Bay. Our goal is to eventually switch all homeless shelters to a navigation center model. 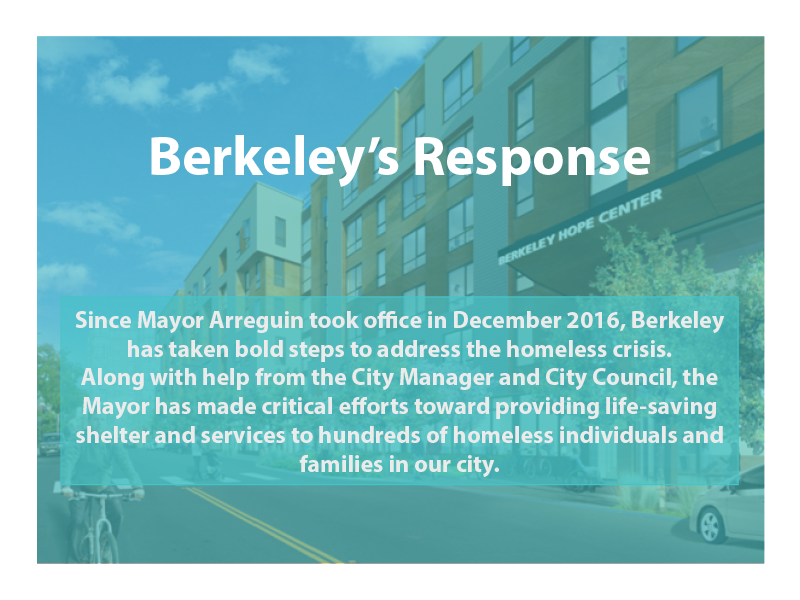 In June 2017, Council unanimously approved prioritizing the Berkeley Way project led by BRIDGE Housing and Berkeley Food and Housing Project in downtown Berkeley. Thanks to the passage of Measures O & P, this project is expected to break ground late 2019 and be completed by 2022. The development will consist of 142 permanent affordable housing units, along with emergency shelter and transitional housing for homeless veterans. Berkeley Way marks the largest investment into housing the homeless and the working poor the city has ever made. The passage of Measure P on the November 2018 ballot will provide significant new resources to expand Navigation Centers, shelter beds, mental health services, outreach, employment programs and housing subsidies for the homeless. We are looking for a suitable location for an RV park that has bathrooms, shower and laundry facilities. 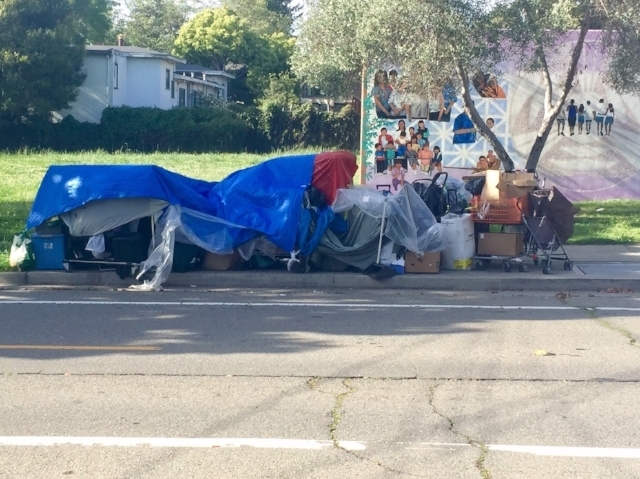 We also plan to increase the number of Port-a-Potties and hand washing stations around encampments and have regularly scheduled garbage collection at encampments and other areas where dumping occurs. Due to our ongoing collaboration with community groups like the Eviction Defense Center and the East Bay Community Law Center, many longtime residents facing eviction have been able to remain housed. Central to the Mayor's plan for combating homelessness is The Pathways Project, which includes both short and long term measures to help shelter our growing homeless population, and restore Berkeley’s streets, parks and neighborhoods to their intended use. 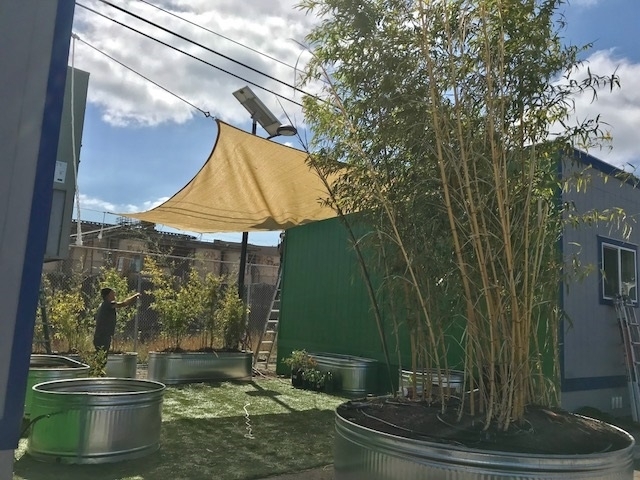 In June 2018, the city opened its first navigation center in West Berkeley, which will allow the homeless to bring their partners, pets, and personal belongings with them. The center is much more than a shelter. Here, the unsheltered get a caseworker who can help them address substance abuse, mental health issues, assist with job searches and eventually connect the homeless to permanent housing or reunify them with their families. As of January 2019, the STAIR Center has helped to place over 70 people into permanent housing, largely through the use of subsidies while they work to receive Social Security or another type of ongoing assistance. Rendering of the planned Berkeley Way development in downtown Berkeley. When built, it will have 142 units of permanently affordable housing, including an emergency shelter and transitional housing for veterans. Over the past year, the mayor's office has been working on the 1,000 Person Plan, a reference to the number of people who are currently unsheltered in our community. The goal is to work with our regional partners to build 8,500 deeply affordable units throughout Alameda County by 2023. In between now and then, we plan to leverage Measure A1 (paid for by all county residents) and state funds to build more tiny home villages, micro units and other transitional housing until permanent affordable housing is built. The goal of the 1,000 Person Plan is to create enough shelter and housing that is affordable to address the needs of our unsheltered population and prevent new people in our community from becoming homeless. We know that no city alone can “solve” homelessness. But working together with other Alameda County cities, we can significantly lower the homeless population and make sure that fewer people have to sleep on the streets. Wendy V. is one of these people. Last year, Wendy, who has lived in her apartment for the past 18 years, was told her rent was going to more than double. This happened after the death of her longtime partner, when her landlord discovered that she was a subtenant and not officially on the lease. The East Bay Community Law Center took on Wendy’s case and advocated for her, ultimately helping her stay in her apartment. Without it, Wendy would have had no choice but to move in with a relative or a friend, or out of state where she had no connections, severing ties to her community. There are also people like Judith Allen, who was being harassed by her landlord to move out just as she was going through chemotherapy. The Eviction Defense Center issued a letter demanding the landlord stop the harassment, to perform much-needed repairs and eventually helped her stay in the unit. Judith told us that without the Eviction Defense Center and the Berkeley Rent Stabilization Board, she would have easily ended up on the streets. Homelessness is a statewide problem, but working together with other cities and the state government, we can bring in people from the elements and help them find housing that is dignified and safe.